Toto has designed a new tankless toilet type called Neorest AH which can save quite amount of water while you’re flushing. Hybrid Neorest AH uses water from both a toilet tank and an external water supply line. 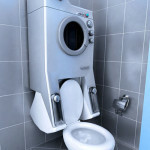 This hybrid toilet is claimed to use just 5.5 liters instead of 13 liters that the conventional pots use. Neorest AH also features technology that can help to warm the toilet seat, it also has auto clean water system, what can you ask for more ? You can see it in action at Japanese Design 2008 Innovation which will be held in Milano from April 16th to the 20th this year.